Electrospray ionization mass spectrometry (ESI-MS) is a powerful tool to study host–guest supramolecular interactions. ESI-MS can be used for detailed gas-phase reactivity studies, to clarify the structure, or simply to verify the formation of complexes. Depending on the structure of the host and of the guest, negative and/or positive ESI are used. Here we report the unexpected formation of host–guest complexes between cucurbit[n]urils (n = 7, 8, CB[n]) and amine, styryl pyridine, and styryl pyridine dimer cations, under negative ESI. Non-complexed CB[n] form double charged halide (Br-, Cl-, F-) adducts. Under negative ESI, halide ions interact with CB[n] outer surface hydrogen atoms. One to one host–guest complexes (1:1) of CB[n] with positive charged guests were also observed as single and double charged ions under negative ESI. The positive charge of guests is neutralized by ion-pairing with halide anions. Depending on the number of positive charges guests retain in the gas phase, one or two additional halide ions are required for neutralization. Complexes 1:2 of CB with styryl pyridines retain two halide ions in the gas phase, one per guest. Styryl pyridine dimers form 1:1 complexes possessing a single extra halide ion and therefore a single positive charge. Negative ESI is sensitive to small structural differences between complexes, distinguishing between 1:2 complexes of styryl pyridine-CB and corresponding 1:1 complexes with the dimer. Negative ESI gives simpler spectra than positive ESI and allows the determination of guest charge state of CB[n] complexes in the gas phase. The online version of this article (doi: 10.1007/s13361-017-1758-0) contains supplementary material, which is available to authorized users. Electrospray ionization (ESI) is one of the most extensively used methods of forming ions for mass spectrometry (MS) detection and analysis. The ion abundances observed under ESI-MS depend on analyte properties, conformation and concentration, on the matrix composition and on instrument transmission and detection parameters [1, 2, 3]. Compounds possessing basic or acidic groups are readily ionized into positive or negative ions through charge separation. Polar analytes that do not have acidic or basic groups can be charged through the formation of adducts with various ions . In positive ESI, analyte adducts with sodium, lithium, ammonium, or other cationic species are common. In negative ESI, adducts with halide ions [4, 5, 6, 7, 8, 9, 10] as well as with other anions [8, 9, 10] have been observed and studied. The ESI polarity used for detection of a given species is not necessarily the same of the target system in aqueous solution. Ion-pairing can change the polarity of ions present in the sprayed solution. This interaction has been used to quantify anions under positive polarity, an approach known by paired-ion ESI . ESI is a soft ionization technique that allows for the transfer of noncovalent host–guest complexes from solution phase to the gas phase . Depending on the properties of the host and of the guest, stable complexes have been observed under positive and negative ESI [12, 13, 14, 15, 16, 17]. Octa acid host, for example, is readily observed under negative ESI , whereas octa amine and cyclodextrins are commonly detected under positive ESI [14, 15]. The ionization properties of the guest molecule also determine the best polarity for detection of complexes. Cyclodextrin complexes with coumaric acids, for example, have been observed under negative ESI . Ion-paring of cationic hosts with negative ions allowed for the observation of capsules and hemicapsules under ESI [14, 17]. Cucurbit[n]urils (n = 5–8 and 10, CBs), another family of molecular containers, readily form ions under positive ESI [18, 19, 20, 21, 22, 23, 24, 25, 26, 27, 28, 29]. 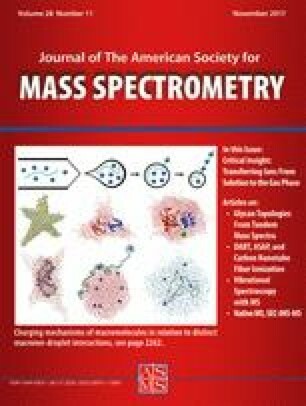 In supramolecular chemistry studies involving CBs hosts, ESI-MS has been used as an analytical tool , to perform gas phase reactivity studies , to characterize aggregates and high order supramolecular structures [23, 24, 25, 26], or simply to verify the formation of complexes [27, 28, 29]. The two carbonyl-rimmed portals (Scheme 1) interact with cations and guest molecules possessing positive moieties, leading commonly to single and double charged ions of CBs and of their complexes. Under negative ESI, complexes between CB and haloacetate anions have been reported . Observation of these complexes was associated with the negative charge of the guest. CB-Cl– adducts were observed under negative ESI  and their formation was suggested to involve interaction with the external surface hydrogens of CB. The outer surface hydrogens of CBs containers interact with negative ions and have been implied in the formation of aggregates and other supramolecular architectures and materials [23, 31]. In this work, we explore the formation of gas-phase complexes between CB and CB hosts and guests amine, styryl pyridine, and styryl pyridine dimer cations under negative ESI (Scheme 1). We report first the ESI-MS behavior of CB and CB containers without guest in the presence of different halide anions (F-, Cl-, and Br-). The studies were then extended to CB and CB complexes with amine and styryl pyridine cations. Finally, negative ESI was used to distinguish 1:2 complexes of CB with styryl pyridines from the correspondent 1:1 CB–photodimer complexes. Amantadine, cadaverine, HBr, and HF were purchased from Sigma-Aldrich (Steinheim, Germany), HCl was obtained from Fischer Chemicals (Loughborough, UK). All materials were used without further purification. Hosts CB and CB were synthesized as reported . Compounds 3a–6a were prepared by following published procedures . Compounds 3b–6b were prepared from compounds 3a–6a after irradiation of 1:2 CB8–guest complexes . Water was obtained using a Millipore Simplicity 185 purification system (Milli-Q water, 18 MΩ cm) (Boulder, CO, USA). Stock solutions of compounds 1 and 2 were prepared in Milli-Q water and compounds 3a–6a in acetonitrile, all at 10 mM concentration. Stock aqueous solutions of HBr, HCl, HF (0.1 M), and of CB (5 mM) and CB (50 μM) were prepared in Milli-Q water. Samples of free CB and CB of 50 μM concentration were prepared in 1 mM aqueous solutions of HBr, HCl, and HF. Complexes of compounds 1 and 2 were prepared at 50 μM concentration (1:1 stoichiometry) for both hosts and containing 1 mM of HBr, HCl, or HF. Complexes of compounds 3a–6a in CB and CB were prepared following the same procedure (1:1 stoichiometry). Complexes 1:2 between compounds 3a–6a and CB were prepared using 50 μM of host and 100 μM of guest. Samples of 1:1 complexes between compounds 3b–6b and CB were prepared by irradiating (λ > 300 nm) the 1:2 host–guest complexes upon near complete conversion of the correspondent 3a–6a compounds. Irradiations of 1:2 complexes of styryl pyridines with CB were carried out using non-degassed aqueous solutions. A xenon high-pressure lamp in conjunction with a water filter to prevent heating of the sample solution was used. An additional Pyrex filter was inserted to remove UV light below 300 nm. ESI-MS and ESI-MSn spectra were obtained using a Bruker Esquire HCT ultra ion trap mass spectrometer (Bremen, Germany), equipped with an ESI source (Agilent GmbH, Waldbronn, Germany) operating in the negative or positive ESI. The solutions were infused into the ESI source using a syringe pump (model 781100; KD Scientific, Holliston, MA, USA), at a rate of 4 μL/min. Typical spray and ion optics conditions were the following: capillary voltage, 3.2 kV; nebulizer gas pressure, 20 psi; drying gas, 300 °C; drying gas flow, 6 L/min; capillary exit voltage, 100 V; skimmer voltage, 15 V.
LC-MS analyses were performed to verify the photoconversion of 3a-–6a@CB 1:2 hots–guest complexes. The system was an Agilent Technologies 1200 Series LC (Waldbronn, Germany), equipped with a diode array detector and coupled to a Bruker Daltonics HCT ultra mass spectrometer (Bremen, Germany). A GraceSmart RP-18 LC column (Columbia, MD, USA) (10.0 cm length, 2.1 mm i.d., 3 μm), stabilized at 25 °C was used. The mobile phase comprises water (A) and acetonitrile (B), both with 0.1% of formic acid. The gradient started with 80% of A and 20% of B. The mobile phase composition changes to 0% of A, 100% of B in 5 min, and keeps this composition for an additional 5 min. Finally, the system was allowed to recover the initial composition of the mobile phase (80% of A and 20% of B) in 1 min and then stabilized for an additional 5 min before the next run. Typical spray and ion optics analysis conditions were the following: capillary voltage, 3.2 kV; nebulizer gas pressure, 40 psi; drying gas, 330 °C; drying gas flow, 8 L/min; capillary exit voltage, 100 V; skimmer voltage, 15 V.
Host–guest complexes of cucurbiturils with various hosts have been observed and studied in the gas phase under positive ESI [18, 19, 20, 21, 22, 23, 24, 25, 26, 27, 28, 29]. ESI-MS can be used for detailed gas-phase reactivity studies, to clarify the structure and stoichiometry, or to verify the formation of complexes. The potential of interactions involving the outer surface hydrogens of CBs macrocycles [30, 31] guided us to explore the behavior of their complexes under negative ESI. The behavior of hosts and their 1:1 complexes under negative ESI in the presence of HCl is described below. Discussion of 1:2 complexes and of the correspondent photodimers will be made for compounds 6a and 6b in the presence of HCl. Other conditions and compounds are briefly mentioned (for spectral details, see the Supplementary Material). Figure 1 presents the full scan spectra of CB in the presence of HBr, HCl, and HF. In aqueous HBr the signal at m/z 1241.2 was assigned to [CB + Br]–, indicating the formation of adducts with this anion. In aqueous HCl and HF, the equivalent adducts were observed, together with a relative intensity increase of the double charged adducts ([CB + 2·Cl]2- and [CB+2·F]2-). The fragmentation of adducts of CB and CB with Br- and Cl- do not lead to significant formation of negative ions above m/z 200. However, fragmentation of F- adducts leads to [CB – H]- ions (Supplementary Figure S1). Similar behavior was reported for crown ether hosts and was related to higher basicity of F- . The cleavage of the Br-/Cl–-CB/CB electrostatic hydrogen bonds should lead to halide ions, whereas fluoride adducts should possess more covalent bonding character and dissociate by loss of HF. Similar behavior was observed for CB (Supplementary Figures S2 and S3). The formation of CB and CB anions confirms that the halide–host interaction involves the surface hydrogens of host. Having the formation of adducts of halide ions with CB[n] evaluated we studied the formation of complexes possessing cationic guests under negative ESI starting with compound 1 (single positive charge) and then compound 2 (two positive charges). Complexes of compounds 1 and 2 with CB and CB (1:1) are readily observed under positive ESI as single and double charged ions [21, 27, 28]. Under negative ESI, single and double charged ions were observed when halide ions are present in the sprayed solution. Figure 2a presents the ESI-MS spectrum of an aqueous solution of 1@CB under negative ESI in presence of HCl (1 mM). Based on the m/z value, isotope pattern and fragmentation spectrum (Supplementary Figure S4a) the signal at m/z 709.7 was assigned to a double charged 1@CB complex, [CB + 1 + H + 3·Cl]2–. Two Cl– ions give the charge to the detected complex, as observed for non-complexed CB. The third Cl– ion pairs with the ammonium moiety of amine guest. The spectrum of 2@CB shows a major signal at m/z 703.2 (Figure 2b). Based on the m/z values, isotope patterns, and fragmentation behavior (Supplementary Figure S4b), this signal was assigned to the double charged ion [CB + 2 + 2·H + 4·Cl]2–. In this case, gas-phase complexes possess two halide ions that pair the 1,5-diammonium guest. As observed for compound 1, negative ESI gives a clear indication of the protonation state of the diamine guest in the gas phase. Unlike positive ESI, where protonation of complexes might be due to guest or to host, negative ESI clarifies the origin of protons. Similar results were observed for CB in the presence of HBr and HF (Supplementary Figure S5) and CB in the presence of HBr, HCl, and HF (Supplementary Figure S6). The above results indicate that complexes of CB[n] with cations can be detected under negative ESI. Halide ions neutralize the cations by ion-pairing mechanism and should be near the cation whereas other halide ions are near the outer surface hydrogen atoms of CB[n] and allow for adduct formation. Complexes of compounds 3a–6a were studied to evaluated the behavior of 1:2 complexes under negative ESI and also the role of substituent groups on the gas-phase structure of ions. Host–guest complexes of compound 3a with CB and CB are already reported in positive ESI . Complexes of compounds 4a–6a with CB and CB have not been studied under positive or negative ESI. All 3a–6a compounds form stable gas-phase complexes with CB and CB under negative ESI. Supplementary Figure S7 shows negative ESI spectra of 3a–6a@CB host–guest complexes in the presence of HBr, HCl, and HF. In all cases, the base peak corresponds to the double charged 1:1 complex. As observed for compounds 1 and 2, all included styryl pyridines are protonated in the gas phase. The results show the all 3a–6a@CB compounds have similar behavior in the gas phase, indicating little effect of the substituent group in the structure of ions. Host–guest complexes 3a–6a@CB were studied in detail in aqueous HCl (1 mM). These compounds readily form 1:1 and 1:2 host–guest complexes with CB under negative ESI. Figure 3a, b, c show, respectively, the full scan, MS2(950.2) and MS3(950.2→824.6) of 6a@CB (m/z 950.2) under negative ESI. Based on the m/z values, isotope distributions, and fragmentation spectra, the signals at m/z 950.2 and at m/z 824.6 were assigned to the 1:2 and 1:1 complexes, respectively. As observed for compounds 1 and 2, ion-pairing between guest cations and halide ions takes place. The fragmentation of the base peak of 6a@CB complexes, MS2(950.2), under negative ESI leads mainly to the double charged 1:1 complex, m/z 824.6 (Figure 3b), and further fragmentation of m/z 824.6, MS3(950.2→824.6), releases the second guest (Figure 3 c), indicating a stepwise loss of guests. This result suggests that guests do not strongly interact with each other inside CB, in agreement with their opposite orientation inside this nanocontainer . Similar results were observed for complexes 3a–5a@CB under negative ESI (Supplementary Figures S8 and S9). For comparison purposes, spectra of complexes 3a–6a@CB were also studied under positive ESI. Supplementary Figure S10 shows the full scan and fragmentation spectra of 6aCB (m/z 880.2) under positive ESI. Under full scan, five major signals can be observed; the free guest at m/z 216.2 ([6a + H]+), 1:1 complexes at m/z 772.8 ([CB + 6a + 2·H]2+), 1:2 complexes (host–guest) at m/z 880.2 ([CB + 2·6a + 2·H]2+), and the signal at m/z 1101.6 was assigned to an aggregate (2[CB + 3·6a + 3·H]3+) . Similar results were observed for complexes 3a–5a@CB under positive ESI (Supplementary Figure S11). Fragmentation of 1:2 complexes under positive ESI gives rise to the free guest, as well as the single protonated 1:1 complex for all compounds 3a–6a@CB. Positive and negative ESI give complementary information of gas phase CB[n] host–guest complexes. Under positive ESI, spectra are more complex, showing signals of the free guest, 1:1 and 1:2 complexes, and aggregates; under negative ESI spectra, less signals are observed, but as studied compounds possess positive charge, signals for free guests are difficult to detect. As similar results were observed for complexes 3a–6a@CB (Figure 3 and Supplementary Figures S8–S11), there is no significant substituent effect on the formation and behavior of gas-phase complexes of studied styryl pyridines under positive or negative polarity. Compounds 3b–6b are expected to form more compact complexes as the two units that form the photodimer are close together. We decided to evaluate the capability of negative ESI to distinguish 3a–6a@CB 1:2 complexes from 3b–6b@CB 1:1 complexes. Complexes 3b–6b@CB (1:1) were prepared by irradiating 3a–6a@CB (1:2) in HCl (1 mM) . Irradiated samples were analyzed by LC-MS to set up conditions for high conversion to photodimers. Supplementary Figure S12 presents LC-DAD traces at 280 nm of 6a@CB before and after irradiation (λ ≥ 300 nm). The results show that after 30 min irradiation, compounds 3a–6a almost vanish and therefore 3b–6b@CB 1:1 complexes should dominate. Infusion of irradiated and non-irradiated complexes of 3a–6a@CB reveal a large effect of irradiation, which can be observed under both positive and negative ESI. Figure 4a presents the full scan spectrum of irradiated 6a@CB under positive ESI. Signals of free 6a (m/z 216.2, Δm/z = 1), free 6b (m/z 431.2), triple charged 6b@CB (m/z 587.2), and the double charged 6b@CB (m/z 880.2) are seen in the gas phase. Other styryl pyridine photodimers, compounds 3b–5b, show similar behavior under positive ESI (Supplementary Figure S13). Negative ESI of irradiated 6a@CB complexes leads to signals at m/z 465.1 and at m/z 932.3. The former signal is the Cl- adduct of 6b, [6b + Cl]–, whereas the latter was assigned to the 1:1 6b@CB complex, [CB + 6b + H + 3·Cl]2– (see Figure 3b). However, unlike the corresponding 1:2 6a@CB complex, only a proton is present. Similar results were observed for 3b–5b@CB complexes (Supplementary Figure S14). The fragmentation of 1:2 3a-6a@CB host–guest complexes (Figure 3 and Supplementary Figure S9) significantly differ from the fragmentation of correspondent 3b–6b@CB 1:1 complexes under negative ESI (see Figure 4 and Supplementary Figure S15). While fragmentation of the styryl pyridine complexes (1:2) leads to stepwise release of guests, as expected, the fragmentation of corresponding photodimer complexes (1:1) leads to release of the dimer, which in the case of compound 6b is visible as its Cl– adduct ([6b + Cl]–). These results indicate that organization of guests in 3a–6a@CB 1:2 complexes is significantly different from that of the corresponding photodimers. Moreover, unlike positive ESI, where for compound 6a, for example, the ion at m/z 880.2 is the base peak before and after irradiation (spectra of Supplementary Figure S10a and of Figure 4a), negative ESI distinguishes 1:2 complexes from the correspondent 3b–6b@CB (see spectra of Figure 3a and Figure 4b). Cucurbit[n]uril (n = 7, 8, CB[n]) nanocontainers as well as their host–guest complexes with amine and styryl pyridine cations can be observed in the gas phase under negative ESI through formation of halide (Br-, Cl–, F–) adducts. Halide ions interact with the outer surface hydrogen atoms of CB[n], leading to formation of single and double charged ions. CB[n] host–guest complexes need additional halide ions to pair with the guest cations and neutralize the positive charge. The ion-pairing mechanism takes place for single and double charged guests and for 1:1 and 1:2 complexes. However, while 1:2 complexes between CB and styryl pyridines possess two additional halide ions, one per guest, 1:1 complexes between CB and styryl pyridine dimers only have one additional halide ion. Negative ESI was able to distinguish these isomeric structures and is, therefore, sensitive to small structural differences between complexes. Negative ESI allows for the determination of the protonation state of guests in the gas phase. This ionization mode gives rise to simpler spectra than positive ESI. Fundação para a Ciência e a Tecnologia, Grant UID/BIA-/04325/2013-MEDTBIO is gratefully acknowledged.